The site you are viewing is a part of The Vi IMproved Editor Webring . This site is owned by Jeff Lanzarotta. Syntax Highlighting for over 200 languages. It is very easy to create new ones. For more information on vi, head over to the Vi Lovers Homepage. .vimrc contains all my personal setting. 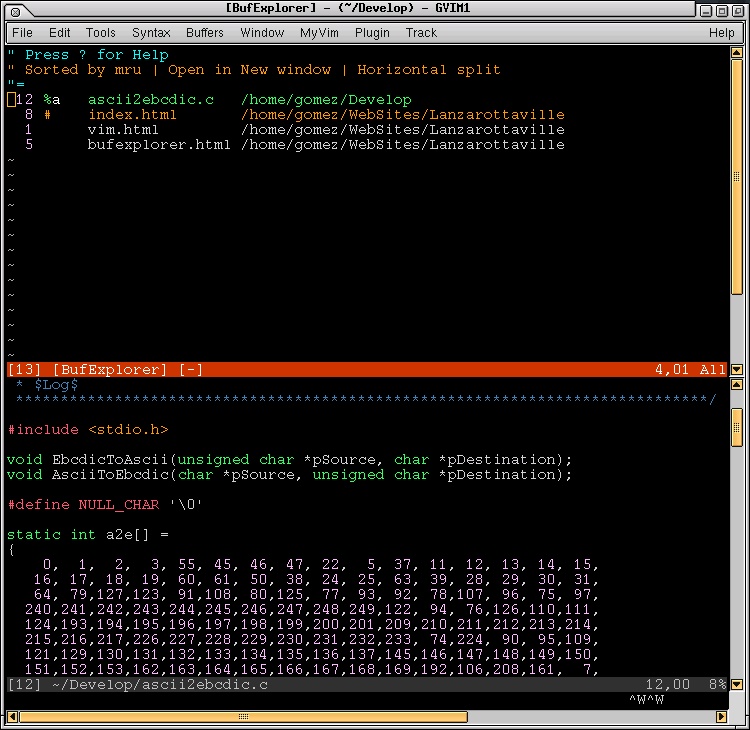 lanzarotta.vim is my personal color scheme. bufexplorer.zip allows you to view a list of all the buffers Vim currently has opened, From the list you can quickly switch to a different buffer of close the buffer without having to know the buffers number. This file contains the bufexplorer.vim plugin as well as the bufexplorer.txt help file. When you unzip this file it will create a plugin and doc directory; therefore, you may want to copy this file to the directory above where your plugin and doc files are located. Don't have to know Vim commands. Sort by 'buffer name', 'buffer number' or 'most recently used' in forward or reverse order. rcs-menu.vim gives you the ability to perform various rcs command on the currently opened file. For example, you can check-in, check-out, checked-out (locked), revert to last version and show rcs history. If you are not using the gui version of Vim, no problem, you will keymappings assigned to allow you to perform the commands. cf.vim is a syntax file for Allaire's Cold Fusion. plsql.vim is a syntax file for Oracle's Programming Language for SQL. nsi.vim is a syntax file for Nullsoft's "SuperPimp" Installer. stp.vim is a syntax file for Sybase's Transact-SQL and SQL Anywhere Stored Procedure languages.